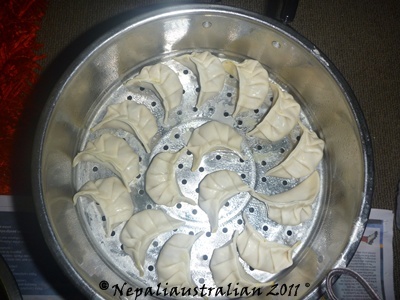 Momo is one of the popular food of Nepal. Yesterday I had a day off so I decided to make momo. There are different ways of making momo but I think the way I do it is the simplest. So here is the process. 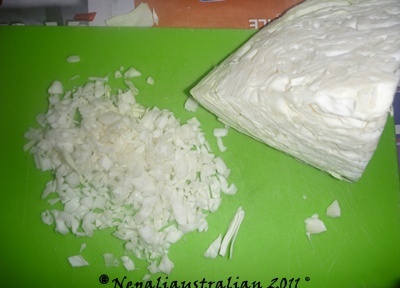 Mix the chicken mince, cabbage, red opinion, garlic, ginger, cumin, coriander, chilli and salt in a bowl. Heat oil in a pan and add turmeric powder. Pour the oil on top of the mixture prepared in above step and mix well. Leave the mixture in the fridge for ½ hours so meat is will be well seasoned. 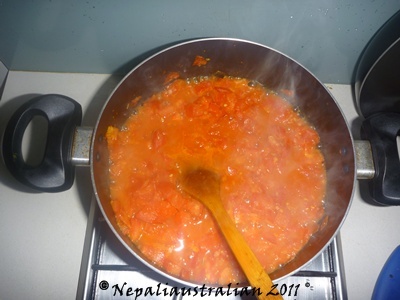 In the mean time, make the golbheda (Nepali tomato sauce) ko achar as mention below. Now we need to pack the meat in the wonton pastry. Take one sheet of pastry on one palm and fold as shown in the video below. You can choose to make a semi circle one (my attempt) or round one (AS’s attempt). Pinch and twist the pleats to ensure the absolute closure of the stuffed dumpling, this keeps the juices inside for a tasty momo. Make at least one pack (30 pieces) before heating the water. Heat water in the steamer. Oil the steamer racks and transfer the dumplings onto the rack. Make sure you leave enough room between two momos to expand during cooking. Once the water starts boiling, put the heat on medium and stack the rack on the steamer. Serve the cooked momo with achar. Momos are best when served hot. Dice tomatoes into small cubes. Add turmeric powder, ginger and garlic and fry for few minutes. Add diced tomatoes and cumin power, coriander powder, chilli and salt and fry for few minutes. Add 2 cups of water and let it simmer on low heat for 10-15 minutes. 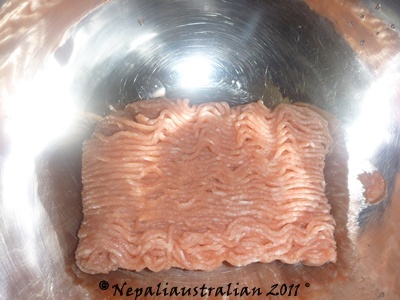 When the paste becomes thick, it is ready to be served. Cut fresh coriander into small pieces. 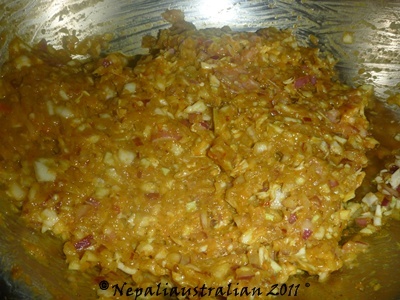 Now add the chopped fresh coriander and mix it in the achar. Enjoy Momo with Golbheda ko achar. 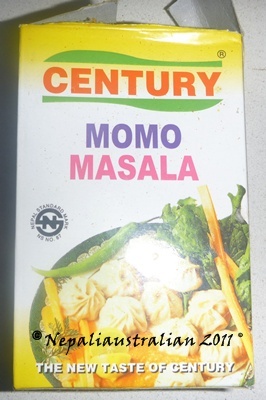 PS: If you can find momo masala in Asian grocery store, you can use that instead of cumin and coriander powder. It tastes better with momo masala. 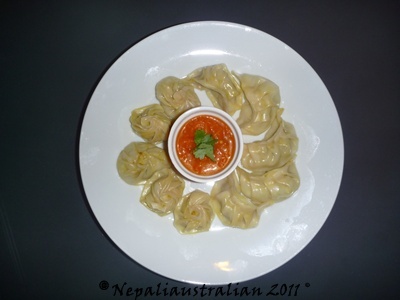 This entry was posted in Foodie, Recipe and tagged dumplings, golbheda achar, How to make momo, momo, Wonton Pastry. Bookmark the permalink. Wow! This is so interesting. The flavor combinations sound divine. I didn’t know about mustard oil. I will look for it. 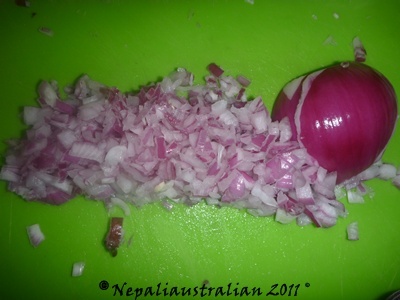 Is it pretty common in Nepalese cooking? 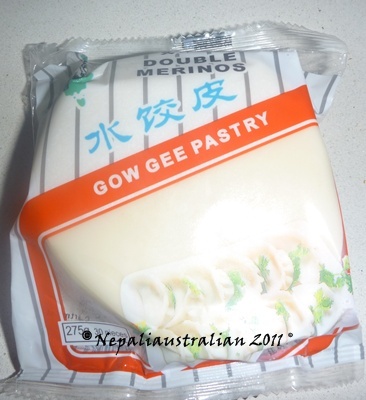 Is it something easy to find in AU? I don’t think I’ve ever seen it. I’ll have to take a look at the local grocery stores. I love the taste of mustard powder and perhaps the oil is even better! Okay! I’ll see what I can find around here and let you know! Ok, friends, I am essentially DYING to ask this – what is the recipe for the filling for Darjeeling momo (other than the fact that they use pork vs chicken)? I’ve tried it a dozen different ways but never like the real thing. Anyone from Darj here? Please pretty please… Oh, and thanks for this recipe here. Definitely roasted + ground sesame is key in achar. @Tash: Momo is best in winter and rainy days . I used the wonton wrappers as it saves lots of time and I am bit lazy. @crazycuitepie : I have tried oven roast tomato achar before and they do taste better than the cooked one. I should be less lazy and try that again. Do we need to roast sesame seeds(til) ? Thanks crazycuitepie . yummy…. one suggestion though (if i may — instead of cooking the tomatoes ..broil them in oven.. peel off the outer layer.. put some grounded sesame seeds(til) , some green chillies and salt to taste..and some pepper…and basically blend them in a mixture.) 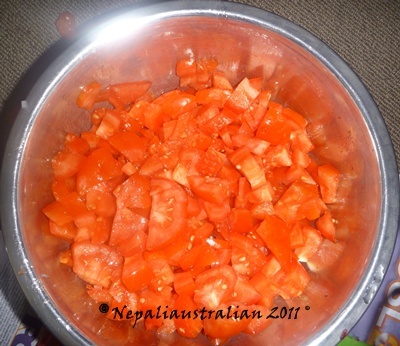 I made the achar like this recently and enjoyed it better than the cooked one..i used to cook it previously too. :)) nice article and it made me crave momo even more . Oh my! Momo.. how I miss it! When I was in Oxford, we had this wednesday market and this Nepali aunty would have her momo stall there! In the freezing cold, her piping hot momos with achar was just.. (the memory gets me salivating!) .. I’ve tried making my own from scratch, thrice! Each time was better than the last, but its never as good. Your idea is great! Should try the wonton wrappers 😀 Thanks M!